I’ve been enjoying the pleasures of reading Lucretius’ classic On the Nature of Things (De Rerum Natura), and will be blogging based on it in the future. I’m concerned today with Lucretius’ approach to therapeutic philosophy and to the pursuit of happiness as exemplified in his parable of the punctured jar. The parable presents Epicurus as a Doctor that heals the ills of the soul. Like all good physicians, he must evaluate the symptoms and determine what the spiritual health problem is. The Frank Copley translation of DRN is much more eloquent in describing the existential situation of an ungrateful, unphilosophical mortal, linking her anxieties to a pervasive, untreated, and unevaluated fear of death. Will you hang back, indignant that you must die: alive and awake, you live next door to death; you waste the greater part of life in sleep, and even waking, you snore, and dream, dream on; you wear a heart confounded by empty fears. You rarely can tell what caused them when, oppressed and drunk and wretched with unremitting cares, you wander, waver, and wonder where to turn. Notice the Buddhist-like reference to wakeful dreaming. What is expected of a philosopher is a kind of awakening, of mindfulness, a way of paying attention. Let’s not think of this as a state (a noun, which often Platonizes what’s meant) but as a verb (an activity). We must be present in order to savor life. That thou indulgest in too sickly plaints? Why this bemoaning and beweeping death? Take now, thou fool, thy unafflicted rest? Will perish foully and fall out in vain? In the text, Lucretius argues that if we were to live forever, eventually the pleasures that the Earth has to offer would be all the same. There would be no new experiences, and therefore we should feel sated at the end of a good life. Ungratefulness to life, to nature, to time, is on the other hand a mortal sin to the Epicurean philosopher. The William Leonard translation does not express it as beautifully as the Frank Copley one, which says: “you wanted what isn’t, scorned what is … life slipped through your fingers shapeless and unlovely“. What’s being said here is that life is full of many kinds of blessings, but when we are mindless and ungrateful it’s as if we are walking through life with a punctured jar. The water in the punctured jar drains off and the blessings are squandered. With the help of Epicurus, we can train ourselves to make the vessel whole again so that we are enjoying the fullness of the blessings that life has to offer at all times. In Book VI, his final one, Lucretius picks up the metaphor again, saying that when we fail to experience life’s pleasures, the “fault must lie within the vessel”, with the broken vessel image representing our own souls. The idea of our brokenness would be usurped by the Christians to build a guilt-based theology. In Epicurus and Lucretius, the goal is therapeutic. Roll in its bosom the grim waves of care. Shuddering, will be upon them in the dark. But only nature’s aspect and her law. Epicurean philosophy, therefore, is meant to help cleanse our souls by speaking truth, and by limiting our desires and fears through exposure to the study of nature, and by establishing clearly that life’s goal is happiness, and by which methods we most efficiently arrive at happiness: Epicurus gave us a science of happiness. Today is the International Day of Happiness. Isolation and depression are proven health risks, epidemics on par with obesity and smoking. A smart mortal would never leave something as sacred and important as his or her happiness to the whims of fortune and chance. Happiness is a path best trod mindfully and in good company. Please share philosophical literature and content with your friends today and take care to restore your own punctured vessel via a philosophical education. You may also enjoy deep-belly laughter exercises for fifteen minutes … or share something funny online, or call a friend who is a clown and always makes you laugh. Whatever you do, don’t postpone your happiness today! Two great intellectual currents converged to create the great river of Epicurean philosophy. The first one is the atomist school founded by Leucippus and Democritus, the laughing philosopher, which concerned itself with the need for scientific and empirical certainly about the nature of things. This evolved into Epicurean physics. The second one was the Cyrenaic school of hedonism, which is the first Greek philosophy that posited that pleasure was the aim of life. This evolved into Epicurean ethics. This blog series explores the threads that run through the Cyrenaic Schools and that make their way into the Epicurean one based on the highly-recommended book The Birth of Hedonism: The Cyrenaic Philosophers and Pleasure as a Way of Life, by Kurt Lampe. 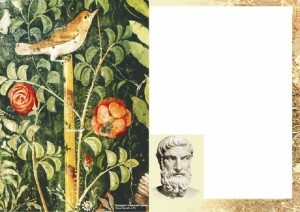 Ι post here a remarcable letter as send it to me by a new Epicurean friend in the Garden of Thessaloniki. Panagiotis Papavasiliou is among us for a few months and he understood very well the issue on pleasure. Panagiotis would be fom now on our Scholarch in the Garden of Thessaloniki and for a duration of six months. Thank you for the attachment containing Boris Nikolsky’s text, I have started reading it and it seems very interesting to me, since the topic on pleasure is the beginning and the mean and the end for us the Epicureans. Until I shall complete reading it so I could comment, I am submitting to you both my point of view about kinetic and katastematic pleasure, their relation to the concept of time, the description of pleasure through pain, and apathy. By observing nature Epicurus distinguished the lucidity (enargeia) of two general emotional situations in which all living beings are, whether pleasure or pain, excluding even a neutral status. Also clear is the tendency of all living beings for pleasure, which he called it good, that is pleasure (hedone) itself and anything useful to achieve it, and trying to avoid pain (ponos), the evil. We know that every human being needs energy to move and be kept alive, which we usually receive through food. For this reason the pleasure of the stomach is the basis of all. We can easily imagine someone not moving/acting by himself to replace the energy he loses necessary in operating at least the vital organs (e.g. if he doesn’t eat) and he do not accept external influences (e.g. if he isn’t fed); it is only a matter of time to exhaust his energy stock and die. Organisms also interact with their environment through their sensory organs. This data is processed in their brain and then they decide on how to take back power from the environment to produce action once again and so on. More precisely, emotions inform (i.e. all the animals that feature emotions, like human) about the stimuli that favour the maintenance of life (pleasure) and those that lead them to death (pain). Therefore, a human in order to live happily will seek for acts that bring pleasure and will avoid those who bear pain. Epicurean theory is not fundamentally different up to here with that of the Cyreneans. And here comes Epicurus, with the sharp eye to grasp what Aristippus of Cyrene could not, the dimension of time in relation to pleasure, its duration. The grandfather manages with the maximum good/tool of wisdom to break down the walls that keep pleasure inside the narrow bonds of the present, extending it to the past and to the future. According to J.M. Guyau, it is time that turns hedone into utility. We avoid a pleasure in the present that will cause pain in the future; we are already receiving the pleasure of an earlier choice that had cost pain etc. Even if you feel sharp pain at the moment, we can ease or even eliminate it by recalling pleasant memories, as we can spoil our mood prejudging a future (non-existing) pain. So we can describe Epicureans as Prudent Hedonists, while Cyreneans as Extreme ones. So with the good of wisdom humans turn the pleasure felt, gained by movement (kinesis) and thus costing energy, into a situation (katastasis) pleasure is felt. And, naturally, I am not suggesting two different pleasures, but one and the same, examining it in relation to time. Kinetic pleasure has a more temporary duration, while katastematic has a more permanent. It does not sound to me that correct to call katastematic pleasure as static, because there is simply nothing static in nature. Even when being in a state of pleasure, we will definitely need kinetic pleasures to remain in that situation. Let’s imagine a diagram such as ECG (cardio-graph), a hedono-graph, where the horizontal axis represents time and the vertical represents the sense of pleasure. On the vertical axis there is a maximum (100% pleasure and 0% pain), a minimum (0% pleasure and 100% pain), and somewhere among them an indefinite but directly perceivable limit when the sense of pleasure prevails over pain. When we feel pain the line moves downwards, and when we feel pleasure it moves upwards. Happy is simply a life that can move the needle of the hedono-graph as much as possible within the area above the pleasure-pain limit. As the gods of Epicurus were immortals, they did not lose energy to be substituted, so the index was stuck at 100% permanently. Unlike gods, we common mortal beings certainly have a mixture of pleasures-pains, in which whenever the pleasures outweigh pains (e.g. 70-30% pleasures-pains) we are in a pleasant condition. This way I can understand the Letter To Idomeneus: “22. On this blissful day, which is also the last of my life, I write this to you. My continual sufferings from strangury and dysentery are so great that nothing could increase them; but I set above them all the gladness of mind at the memory of our past conversations. But I would have you, as becomes your lifelong attitude to me and to philosophy, watch over the children of Metrodorus”. Something similar happens with the example you mentioned the other day Elli, suggesting that when I feel hungry but, since I know there food back at home that I am heading for, I only feel pleasure, not pain. In this situation I certainly feel my stomach pain from hunger, but through prudence I project and receive in advance the pleasure of some hot homemade food, which I consider safe to infer because that used to happen in the past. So I still potentially am in the same hedonic situation as before, bypassing the warning voice of the flesh via prudence. As for the dilemma of “is pleasure the absence of pain or pain the absence of pleasure”, it really is a pseudo-dilemma, as most are, if not all. The essential difference here is in the disjunction “or” that uses the law of non-contradiction. In epistemological terms we can still use a reductio ad absurdum (Epicurus himself used it in order to prove the existence of atoms and the void) and every other logical method, as long as the inconceivability criterion is valid in any case. Though, using the method of Multiple Explanations (pleonachos tropos, or multi-valued or fuzzy logic) we prefer conjunction over disjunction, by suggesting both pleasure “and” pain. They both give us information about the emotional interaction we have with nature in order to make the necessary choices and/or avoidances when we seek pleasure, which is always the aim of our nature. The dying Epicurus, though he feels pain by the disease, he simultaneously feels pleasure, which is so much greater that he manages to keep blissful; he had finally remained in the hedonic situation that dominated. Moreover, we will end up in Stoic apathy if we deny our passions, which all generally lead into pleasure and pain. The Stoics are they who deny both, saying that it does not matter what humans feel eventually, since whatever is predetermined for one to live, that he will live. 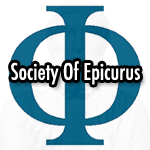 Like Christians, trying to respond to the so-called “riddle of Epicurus” went so far as to deny the existence of evil (the riddle was not written by Epicurus himself, but it is attributed to him by the apologist Lactantius I think, who mentions it). We Epicureans not only recognize our passions, but our passions constitute a criterion for truth, and their “positive” side, pleasure, is the only “end” we recognize by our human nature. I am sorry first for being late in replying, and second for the extent of my writing and the various repetitions. But I threaten you both that once I finish this article, I will come back with even more! What do you say to share our chat with the remaining members, so that they would join in? Even better I suggest we place it on our forum. I hope to see you in the evening. In my recent visit to the federal capital, I was taken in by the majesty, the beauty and the history of the buildings of our government (and corporations, these days there’s no clear boundary). If I had not understood the alphabet and was to judge the buildings by their architecture, Bank of America’s building would have been a government building. Without writing an edict or enacting a law, the government and the banking cartel had articulated messages through the architecture. The banks are making themselves out to be indistinct from our government and government buildings frequently utilize architectural styles that mirror the glory of ancient Greece, claiming for themselves the humanist legacy of the land that saw the birth of the earliest form of democracy. It’s interesting to note a land’s architecture and the narratives (and identities) that are woven into it. There is much that is implicit in the red of Chinese architecture: a state-sponsored narrative of revolution from the top down. Whether or not we buy into the narrative, the act of displaying it with pomp makes the narrative powerful, relevant, and pervasive in the culture that witnesses the architecture. A society’s architecture shapes the people’s identity in many subtle ways: by being ever-present, by lurking high above the people, by serving the ruling classes as a symbol of their power and legitimacy, and by the layers of history that nourish a people’s attachment to the sites. Accidents of abuse and rebellion can at times evolve, within the urban setting, into monuments to the people’s history. I’m reminded of how the Stonewall Inn, where gays first fought back police brutality in 1969, has become a site of pilgrimage for many LGBT people comparable to the monuments to the founding fathers in DC. Not all architectural narratives happen from the top down. And then there are the hidden, and Freudian, narratives, the (perhaps?) unintended ones. The phallic symbols that embody power, conquest and fertility. In my visit to DC I noticed that our national obelisk (fashioned after the ancient Egyptian model) was being fixed, curiously during a time in which America’s global hegemony is increasingly being questioned, as if old Uncle Tom was in need of viagra. We all, consciously or not, choose to identify with various types of architecture according to sets of values and aesthetic tendencies that reflect, I believe, much more about ourselves than we may even know. In watching science fiction for many years, I’ve noticed the curvy and anarchic urban designs found in films like Star Wars, Planet of the Apes, and other futuristic films (whether utopian or dystopian). I’ve always been intrigued by how so many science fiction storylines imagine (and intuit) the architecture of the future in this way. Notice how, in the Star Wars planet of Tatooine, the inner architecture of homes is almost organically curvy and blends into the ground and the land effortlessly. Like the people of our much-feared overpopulated future, the people of Tatooine live in deserted lands where water must be harvested. Joseph Campbell, the famous mythographer who mentored George Lucas during his years of incubating the Star Wars narrative, believed that a circular or round form favors wholeness and is a symbol of the Self and of completion. I say these shapes also promote egalitarian models of relating to each other, whereas a pyramid has obvious classist connotations, and was in fact the most famous symbol of one of the societies that was most loyal to class divisions in antiquity: ancient Egypt. The recent stirrings of the Egyptian revolution could have only happened long after the ruins of its past glory had been overtaken by the sands. Notice, for contrast, the openness and flatness of the sites of modern revolutions: plazas and squares like Tahrir and Zuccotti Park. Notice also how the idea of Occupying a space, owning it, and giving it a new identity (Zuccotti became Liberty Square) becomes an act of writing history, of weaving new populist narratives, and how these narratives that emerge from horizontal spaces explicitly repudiate classism (the 99% versus the 1%). The futuristic documentary The 11th Hour, in proposing solutions to the present environmental and spiritual crisis that humanity faces, presents ideas for redefining progress by building our architecture and our machines in the image of how nature makes things efficiently rather than with the mindset of taming or controlling nature, which is admittedly the failed spiritual longing of our predecessors. By embedding our technology into the cycles of nature, we work with her rather than against her and we secure a sustainable future for our descendants in this so-called anthropocene age of our own creation that we are entering. There is a deeper intuition behind this emerging mindset, which leads me back to my own spiritual and philosophical master, Epicurus, and to the architectural model that he called for. Ponder the semantics, the layers of meaning behind the architecture that he meant to favor, the type of covenant with nature that is implicit in the image of the Garden, which served pragmatically as a source of agricultural goods but was also his house and his school. Gardens, in many of the worlds’ mythologies, serve as metaphors for the earliest and future paradise, the green world full of life that all the desert religions dream of, but to us this paradise is not other-worldly. It is the space we are called to occupy. Epicurus wanted his followers to be Gardeners, nature’s responsible, happy and awakened care-takers; and also scientists, the types of sages whose wisdom is derived from the study of nature. The space he meant for them to occupy was one of serenity and beauty, of civilized pleasure always in the presence of nature. The Garden is a metaphor for bringing nature back into the city, for being both natural and civilized, and for Epicurus’ dethronement of reason in favor of nature, not to deny or repress reason but to utilize it under the guidance of nature. In Epicurean cosmology, man must engage in the study of nature (science) but is not destined to tame nature or called to govern nature by force. Epicurus was very ahead of his day, and yet he is ancient and eternal. The Earth will go on, with or without us. She does not need us in the way that we need her. In fact, viewed from space human civilization looks like a cancer, like a giant bacteria that is attacking and overcoming her. We ‘tame’ nature to our own detriment. In order to be spiritually relevant and useful, our narratives of progress must learn from and imitate nature instead of seeking to overcome and control her. We can read into the architecture of the Garden how nature is built into the home, into civilization, into the polis, the city, into family and community life, how she is invited to be present there in the midst of it all. She’s not exiled. We don’t robe her in pavement or cement: we invite her in and she dwells among us.